Video will vindicate Alec Baldwin after he was accused of striking a man in the face over a parking space, the actor's lawyer said Monday. 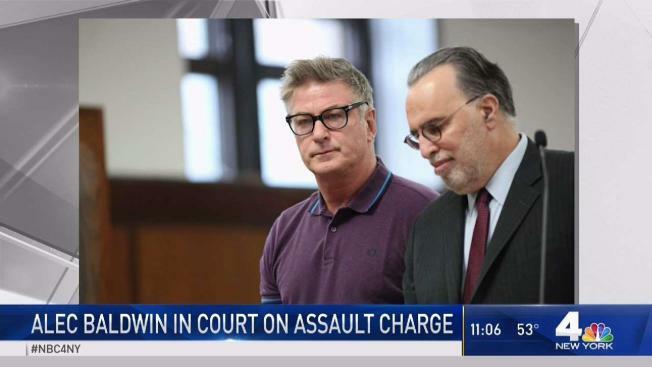 Baldwin himself said nothing as he was arraigned on a misdemeanor attempted assault charge and a charge of harassment, a violation, in the latest of his several brushes with the law over the years. The Emmy winner has previously denied he punched anyone in the car parking clash outside his Manhattan apartment building Nov. 2. Lawyer Alan Abramson echoed that denial Monday and added that "incontrovertible video evidence" proves it "beyond all doubt." "Mr. Baldwin did not commit any crime, and we are confident that once this matter is fully investigated, it will be resolved swiftly and appropriately in court," Abramson said. He didn't show the video and declined to give details about it. Prosecutors, meanwhile, said in court papers the 60-year-old star told a police officer the other driver "stole my spot," used a vulgarity to describe him, and acknowledged: "I did push him." Baldwin, who came to court in a purple polo shirt and dark pants, didn't enter a plea. It's normal not to do so at this stage of a Manhattan misdemeanor case. He was released without bail and is due back in court Jan. 23. Baldwin tweeted after his arrest that reports of the episode were "egregiously misstated," and his lawyer said Monday the actor's "reputation has been damaged by media reports that claim that he punched a man on a New York City street." The fracas began after the other driver pulled into a parking space that one of Baldwin's relatives was holding for him, and the two men started quarreling and pushing each other, police said earlier this month. A court complaint filed Monday said the other driver told police Baldwin shoved him and hit him in the face with a closed hand, causing him pain, according to a court complaint. The 49-year-old man was taken to a hospital for treatment. While police arrested Baldwin on assault and harassment charges, prosecutors changed them Monday to attempted assault and harassment. The attempted assault charge requires proving that someone intentionally tried to injure someone physically. The assault charge, on the other hand, would require establishing that someone intentionally or recklessly did injure another person, or negligently used a deadly weapon or "dangerous instrument." Baldwin, the star of former television sitcom "30 Rock" and current host of "Match Game," has portrayed Republican President Donald Trump on "Saturday Night Live" and recently started a talk show on ABC. Baldwin has gotten into a number of public confrontations, some of them leading to legal trouble. He was arrested in 1995 after being accused of slugging a paparazzi photographer in Los Angeles, and he was thrown off an American Airlines flight in 2011 after a dust-up with a flight attendant who asked him to stop playing "Words with Friends" and turn off his cellphone. In 2014, Baldwin was arrested in New York for allegedly getting belligerent with police who said they stopped him for bicycling the wrong way on a one-way street. "Looks like you have a short fuse," a Manhattan judge said when he put that case on track to be tossed out, which it ultimately was. "I know there's an impression that I'm someone who seeks to have violent confrontations with people. I don't," he said.